I've made a wonderfully colour-coded spreadsheet, a row for each town or villager, or where more than one memorial is specifically mentioned then individual rows for each. I fill in little blue boxes for 'they are still talking about it', green ones for 'we are collecting money, concerts, raffles, cinema shows and rattling tins at football matches' and finally orange ones for 'Unveiling of a memorial reported'. The blue boxes dominate in the early years of course, with hardly any orange ones in 1919 but by 1920 there are swarms of unveilings going on and it continues with memorials popping up in all kinds of places. This presentation of my data allows me to scan across a place and see their progress towards a memorial and to see patterns - Dodworth for example, towards the bottom of the snip above, do a lot of talking but not much is happening! I've already mentioned my findings in 1921, and in 1922 you can add memorials at Barnsley Cricket Club (well they started talking about it and collecting money), Broomhill Methodist Chapel (which moved across the village in the 1930s and is now a private swimming baths - any chance the memorial survived? ), a temporary wooden structure in Penistone to make sure they really liked the design proposed, and church related memorials, including tablets and windows and so in in Thurnscoe, Brierley, Mexborough, Silkstone, St Mary's in Barnsley, Wath Main Colliery and Worsbrough Dale, outside St Thomas' church. Of course the main memorial in Barnsley, which now stands in front of the Town Hall, comes in for plenty of discussion. In 1922 they reduce the estimated cost from £10,000 to £5,000 in view of the 'trade depression and the long succession of industrial disputes'. A design is approved in June and in July the Mayor appeals for funds. He also mentions a plan to 'have the names of the fallen inscribed on vellum and preserved with the records of the Borough in the Town Hall'. Unfortunately if this was ever done Barnsley Archives haven't got it! 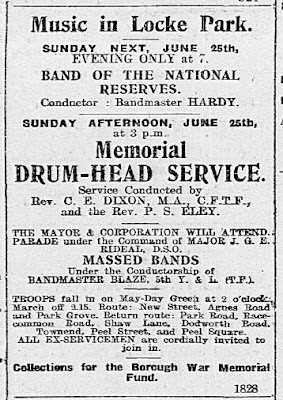 Band concerts have been held in aid of the War Memorial Fund and the Beckett Hospital since the war ended and a running total of the money raised is included in a listing of all the subscribers to the Memorial Fund. "Net Proceeds from Band Concerts and Cinema Concerts organised by Messers Chamber and Smith - £843 8s 6d", which is a significant chunk of the £1,325 raised in total. This makes it all the more unbelievable that in October one of the councillors objected to giving permission for the concerts to carry on for another year in Locke Park - happily he was voted down. 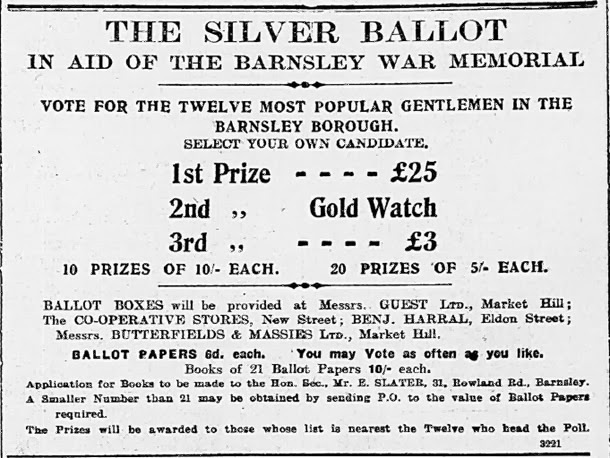 The fundraiser that really surprised me was 'The Silver Ballot', 'Vote for the twelve most popular gentlemen in the Barnsley borough', which was launched in November 1922. Apparently you could win £25 or a Gold Watch ... I look forward to reading the results in the 1923 papers later this week! In December the Mayor confidently announces that he "hopes the Memorial will be completed in about six months time". He goes on to comment that many other places have already got theirs and that the large congregation on Armistice Day that year had shown that a memorial was needed to provide a place for people to gather to commemorate the fallen. 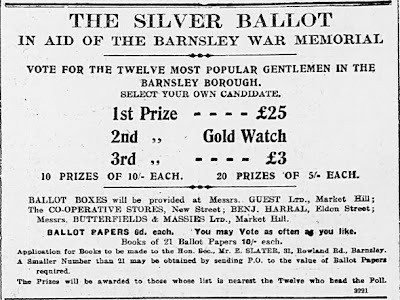 Unfortunately I know that Barnsley's War Memorial was not unveiled until 1925, so there must be some more delays and obstacles to its completion in the next couple of year's papers. Doing this research is a bit like reading a who-dunnit where the crime is revealed in the first chapter but it takes you right until the end of the book to find out how it was done!